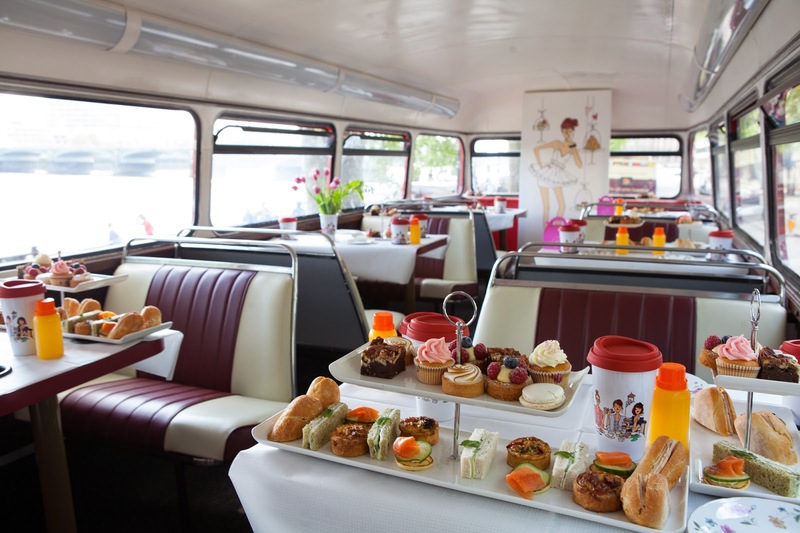 Fluid London's Christian Rose-Day steps onboard an old Routemaster bus and takes a tour through Central London whilst carefully stuffing his face with sandwiches, scones and hot tea. This has to be one of the more unusual afternoon tea in London experiences I've had the pleasure of sampling. 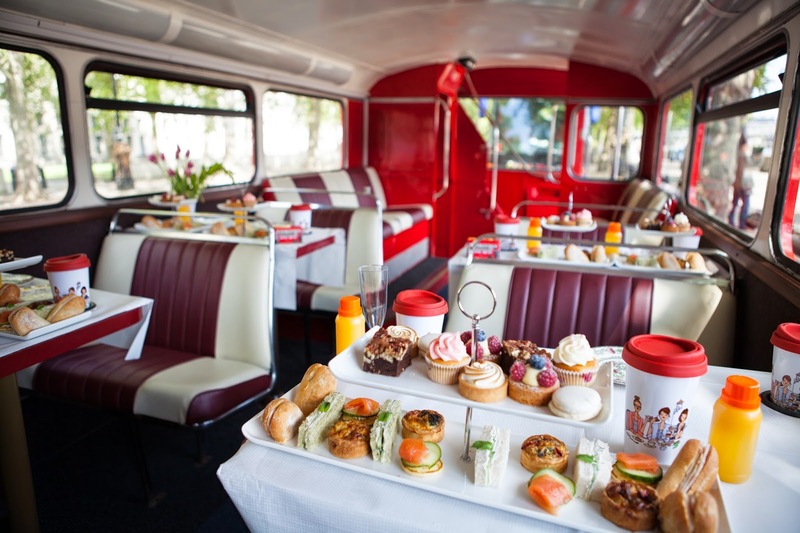 The idea was dreamt up by BB Bakery, who have a permanent tea and cake establishment in Covent Garden. 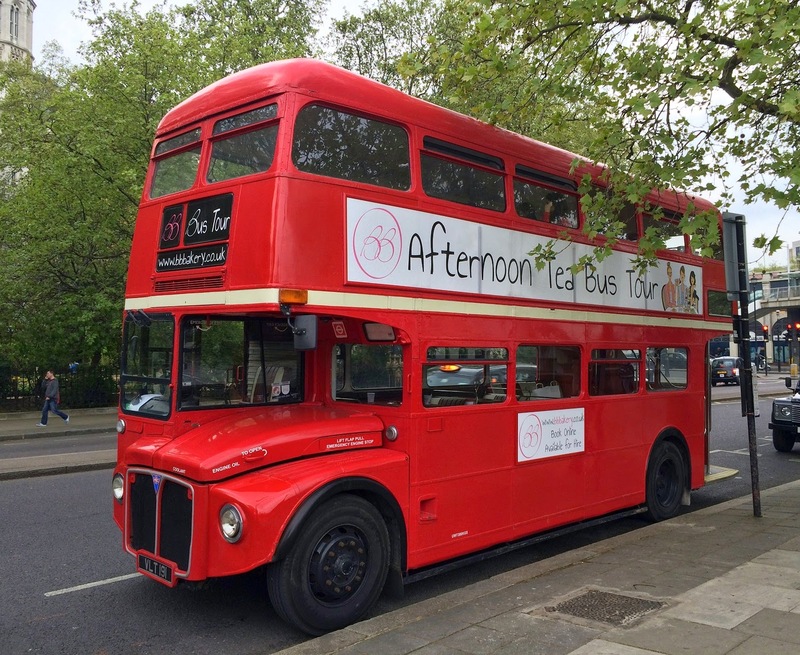 The afternoon tea bus tour starts and ends at the London Eye and takes in Big Ben, the Houses of Parliament, Buckingham Palace, Harrods, the Royal Albert Hall, Hyde Park, Marble Arch, Piccadilly, and Trafalgar Square. The map is helpful stuck to the table, along with several suckers, as pictured here, which help to stabilise your plate. (Note, there are no toilets on board and the tour is lasts more than an hour, so go for a tinkle before you embark). Due to the nature of being sat on a moving vehicle, there is a certain amount of toing and froing so don't expect this to be a smooth ride. The tea is actually served in coffee shop style lidded mugs so that hot tea isn't splashed all over your nice new outfit. There's also a handy booklet to accompany your tour so that you read up on all the main sites that pass by. There is no loud speaker commentary, so idle conversation is encouraged. Don't worry if you don't eat everything. You're given a little doggy bag at the end of the tour. Be prepared to have your photo taken quite a lot. There will be many people outside the bus peering in at you, jealously, with cameras in hand. Give them a wave. Make them smile. 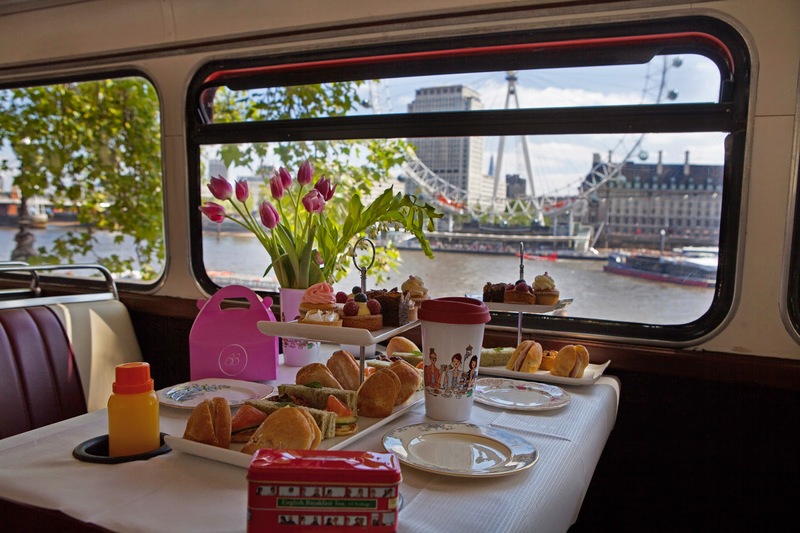 For a more tranquil, stationary experience, there are other afternoon teas in London. Fluid London's Christian Rose-Day discovers that London's Docklands can be a peaceful, serene place to dine, on the weekend. Admit it, when considering the options of where to go for brunch in London on a weekend, you mostly likely choose that place that's just at the end of your street. Occasionally you might venture a little further, but nothing more than one stop on the bus/tube/bike/train. Adding the third choice of Canary Wharf into the mix would probably result in chuckles of derision. But mark my words hungry weekenders, the brunch at One Canada Square is definitely worth the trouble of negotiating public transport. It may require one or three less glasses of wine the night before after work, but just at that baled New York style cheesecake and blackberries! Did I mention the brunch is three courses! So, you arrive at the monolithic pillar of finance, slightly weary (recommendation: eat a piece of fruit before you leave just to get you through the journey), and stare up at the whispering clouds as they sail past this mirrored obelisk. Before running off to seek your breakfast, look around and enjoy the scenery: the lapping water, the canoodling couples; the peace and quiet in an area that, during the week, is probably teeming with ant-like life. One Canada Square is on the ground floor of the main Canary Wharf building itself, tucked away in the far corner next to the lifts. It may not sounds glamourous but once you arrive you'll see that it's nothing but. Key info section, so pay attention: the One Canada Square weekend brunch offer keeps going until 5pm on Saturdays. If you're ravenous, go for the 3 courses for £25, and if you're not, 2 course for £20 should suffice. The best bit? For an extra £15 per person you can get unlimited Bloody Mary's, raspberry Bellinis or house wine. We asked how far we could test this offer. Apparently, if you're eating, your glass can always be full. I'll leave it up to you to decide how much you can consume. For the brunch main it was Dorset crab linguine and chilli oil (above); and cep ravioli with parmesan (below). If you arrive near to 1pm you'll have the added bonus of a live pianist to entertain you on a white, mini grand piano. I'd suggest stopping off for one last cocktail in the bar area before you leave. And make sure you explore on your way to the toilets. A lovely Art Deco hideaway can been found next to an upstairs bar area which, by the looks of it, is a great place to host a private function. A beautiful way to spend a Saturday (late morning to early afternoon).